Prime Minister Narendra Modi on Monday pointed out that the difference between the manifestos released by his Bharatiya Janata Party (BJP) and the Congress was evident in their names. "Theirs is an announcement, ours is a resolution," he said in an exclusive interview to Network18 Group editor-in-chief Rahul Joshi. The Grand Old Party released its manifesto titled "Congress Will Deliver" on 2 April, promising to tackle the employment crisis, poverty, farmers' woes and crimes against women. 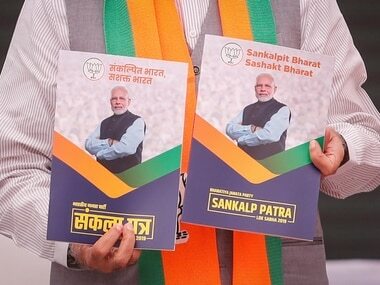 The BJP released its poll document titled "Sankalpit Bharat, Sashakt Bharat" on Monday, in which the saffron party focused on development, national security, Uniform Civil Code, Ram Temple and tackling terrorism. Speaking to News18 hours after his party released the "sankalp patra", Modi said: "I would like the intellectual class to compare both our manifestos. Our manifesto should be viewed on the basis of our track record. The Congress manifesto should be weighed against their track record. There is a world of difference on many parameters." "We are at the crossroads of eliminating terrorism. Terrorists are demoralised as we are winning a psychological war against them. Instead (of backing such efforts), the Congress manifesto is soft on terror. Their views on the army are similar to those of Pakistan. No patriot will tolerate this language. Their manifesto talks about removing AFSPA — the Armed Forces (Special Powers) Act. This amounts to removing weapons from a soldier's hands." Modi further said that BJP's was a "mature manifesto" drafted by a "responsible political party that will be given the task of continuing to govern the country". "For the first time, we have presented a manifesto that lays down a roadmap for both 2022 and 2024. This means the government's accountability will not end after five years. No party has ever done this before. Highlighting some of the key points of the BJP manifesto, the prime minister said the party aims to "lay the foundation for where the country should be in its 100th year of Independence in 2047", as well as ensure national security and tackle black money and corruption. "Earlier manifestos have done grave injustice to the poor, Dalits, downtrodden, deprived and tribals. There has been no time-bound programme for their development. What can be done for women, youth and senior citizens? How can the lives of villagers and farmers be transformed? And how to build a Modern India? How can technology be used for development and to meet the common citizen's aspirations?" "In the five years since 2014, we have worked to bring India out of a cocoon of despair, to bring in a new era of self-confidence," Modi said. "We have focused on the needs of the common citizen — housing, power, water, roads, etc. We have fulfilled basic needs in the past five years. In the next five years, we will work on empowering people to fulfil their aspirations." 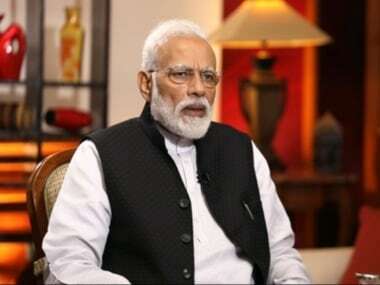 In the interview, Modi addressed several other subjects, such as Bahujan Samaj Party chief Mayawati seeking Muslim votes, the Congress promising to review the Armed Forces (Special Powers) Act, the impact of the "Mahagathbandhan" in Uttar Pradesh, India-China relations, economic growth, demonetisation and why he thinks India would have achieved a lot more success a lot faster if Sardar Patel had been prime minister instead of Jawaharlal Nehru. The interview will be aired at 7 pm on Tuesday night on CNN-News18 and all other 19 news channels of the group. Firstpost will also stream the interview live.